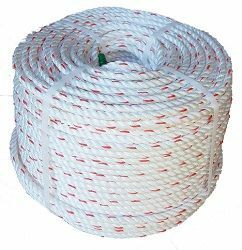 White 3-strand Polysteel Rope with a Red Marker sold in bulk coils of 220m and also cut to length by the metre. This floaty pot rope is manufactured for us in Europe to EN ISO 14687 and has a density of 0.94 so will float in water. Polysteel is tough, durable & economical and is widely used as a pot rope in shell fishing. Polysteel is also widely used in agriculture as it is economical, durable and around 30% stronger than normal polypropylene rope.